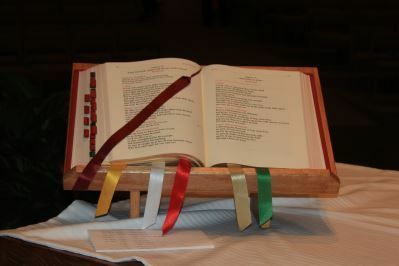 Our pastor, a wonderful priest named Father Raymond McDaniel, presently uses a clear acrylic book stand on the altar for reading the liturgy of the Mass. While functional, it’s not a very good looking piece. A priest should have stand made of wood and this is what I have made for him. It’s not a surprise, though. Since I was going to do something nice, let’s do it right and ask if there’s any customizing he would like. Sure enough. 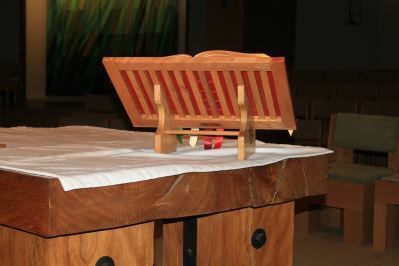 Rather than the book’s bottom be right down on the altar, he asked for it to be raised up about 4”. Also he asked that the angle of the stand’s face be raised a few degrees. So it has been done. I used white oak, stained simply with ‘Natural’ color stain so as not to interfere with the wood burning. Then I applied a few coats of clear satin poly. 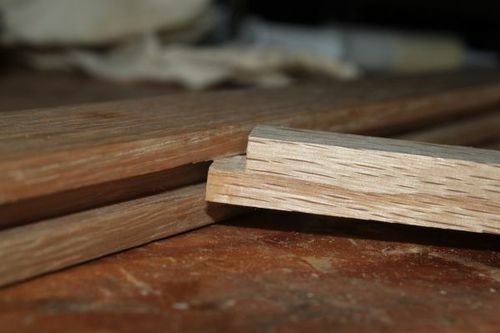 The edges of the frame are slightly chamfered, but not the edges of the slats. Look at the two photos I shot during construction. The two slats under which are the legs of the stand are full thickness of the frame while the other ten slats are only 2/3’s. 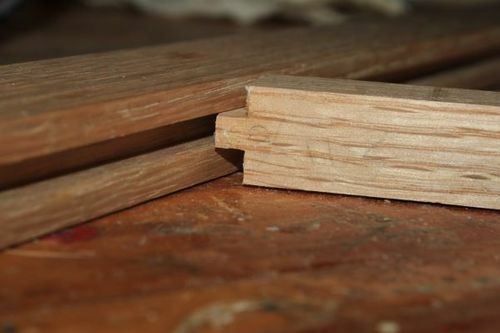 The dado is 1/4” cut by dado blade in tablesaw. I simply use 5/8” long x 1/4” ‘spacers’ between the slats. This method is a whole lot easier to construct than drill cutting spacer holes, 26 in all, in the rails of the frame. It may not satisfy the purist woodworker but this worked out great. Notice also how much wider the tray is 20+” versus the width of the stand legs 9+”. By design. 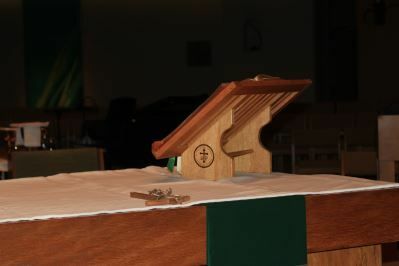 in that way, the smaller “footprint” allows Father to place the stand to the side of the altar, close to the edge and the book can actually be over the side. This minimizes the space it takes on the altar. BTW, here is a photo of the altar.During Mass there would be a white cloth completely covering the top. Finally, after a year of Father being our priest, I got around to working on this gift, a wood stand for our beautiful Texas oak altar. 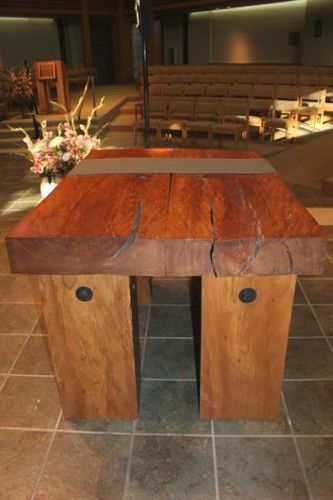 The imaged burned into each leg of the stand are the old brand “Come and See” and the new brand “SP” of the parish, St. Philip the Apostle Catholic Church in Lewisville, TX. “Come and See” us some time. On Thursday 8/21/2014, prior to our 6:30AM Mass, I finally presented the lectionary stand to Father. He was thrilled, he blessed it and we took it to the altar and used it this AM for its first Mass. At the end of Mass, Father McDaniel publicly thanked me for my gift. I am so blessed. So here are a couple of more photos of it on its new home. Wow, what an honor to have your work on the altar and at each mass. Well done. Saint Joseph, my favorite carpenter, I’m sure is very proud of you.